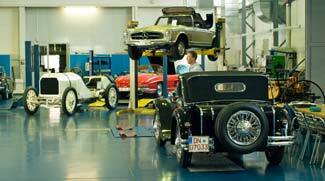 When you're ready to restore your vintage Mercedes (or to buy an already-restored collector's car), contact the M-B Classic Center in Stuttgart, Germany. ABOVE: Car restoration in the Werkstatt. INSET BELOW: A vintage Mercedes-Benz from the Classic Center's collection. Stuttgart, Germany is a city that takes pride in its automotive heritage, as evidenced by the Gottlieb Daimler Memorial and the Mercedes-Benz Museum, both of which are essential stops on any car enthusiast's trip through Germany. But history means more than places or institutions: Material culture plays a vital role in preserving the past, and The Mercedes-Benz Classic Center in Fellbach (a suburb of Stuttgart) serves as "a guardian of the brand's tradition" by restoring historic cars and supporting owners of vintage Mercedes-Benz automobiles. It supports "Classic Partners" such as dealers, independent workshops, and Mercedes-Benz clubs around the world. Although the Classic Center isn't a tourist attraction per se, it welcomes visits by Mercedes-Benz owners, mechanics, and enthusiasts. It also offers free guided tours on Mondays. For details and directions, see page 2 of this article. Inset photo copyright © Mercedes-Benz.